As you may know, a couple of years ago, we declared John Skelton the Official Favorite Athlete of The Sports Section, for reasons explained here. At the time, he was a fifth-round draft pick out of a school not traditionally known for producing starting NFL quarterbacks. But he started four games in his rookie year. Last year, he started seven more. 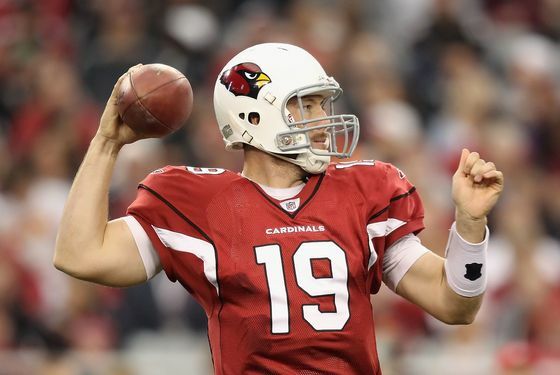 And now, with the start of the 2012 regular season less than a month away, he's got a shot to become the Cardinals starting quarterback out of camp. There's a bona fide competition for the job this summer, and earlier this week, Adam Schefter reported that Skelton is considered the favorite. Hooray! For what it's worth, Willie McGinest, who now works for the NFL Network, said on the air last month that his friends on the Cardinals told him that they prefer Skelton. (Kolb said one of his linemen was laughing about the report, while Skelton said he doesn't know what McGinest was talking about.) This much we know, though: More than 80 percent of people who voted in a Phoenix New Times poll asking who should start for the Cardinals chose Skelton over Kolb. And really, what's more scientific than a web poll? The people, obviously, have spoken. Not that Skelton will talk about his position as the front-runner for the job. Said the quarterback in today's Post: "I don’t buy into what the media says. It really doesn’t have any bearing on my confidence." Added Skelton: "Over my past few games I’ve been playing good, but not great. There is room for improvement, but I see the work I have been putting in day-by-day is paying off." Skelton's numbers were hardly spectacular last year, but for what it's worth, the team did go 5-2 in games Skelton started last season. (There was also the December 11 game against San Francisco in which Kolb got hurt on Arizona's third play of the game, and Skelton went on to throw for 282 yards, three touchdowns, and two interceptions that we prefer not to focus on.) All Skelton, who started Arizona's second game of the preseason last week, has to do to win the job is be better (or even just healthier) than Kolb. We like his chances.